Preface for 3.0: This article has been updated for 3.0. None of the concepts were changed, but the mentions of out-dated info, like skill trees, have been removed. Critical Chance – commonly called crit – is one of the most misunderstood and over-simplified stats in SWTOR. Too often a single number or percentage is cited as the target crit level, such as 25%. This simplified answer obscures the relatively easy-to-understand true nature of Critical Chance, and prevents people from understanding exactly how they should gear their character. I will attempt to demystify Critical Chance and help educate on a better way to think about Critical Rating. To start, Critical Chance and Critical Rating are not interchangeable terms; they do NOT mean the same thing. Using Crit is a non-specific term. To some it may mean Critical Chance to others it may mean Critical Rating. I will avoid its use going forward. Let’s now define what Critical Chance is. It is the likelihood a successful attack or heal will provide increased effect. The magnitude of this increase is based on your Surge percentage. In simpler terms, critical hits or heals do more damage or restore more HP, respectively. In addition, there are many skills and abilities that synergize with critical hits or heals. This can result in increased Alacrity or resource generation as examples. Critical Rating is specifically a secondary stat in the game. It is commonly found on Mods and Enhancements. It may be surprising to learn that it is a very small component of Critical Chance. Everyone’s base Critical Chance is 5%. You can see this by hovering over any of the Critical Chance percentages on your Character screen. There are two universal and easy-to-get boosts to your Critical Chance by a set percentage. The Imperial Agent/ Smuggler class buff provides +5% Critical Chance. Plus, reaching max affection and completing the story quest for your rDPS companion will grant you +1% Critical Chance. (You can find a list of each class’s rDPS companion here.) Now, our new baseline for Critical Chance is 11% and this is before we have equipped any gear. Many Discipline paths will have talents that increase some aspect of your critical chance. The boost may only be for a specific attack or heal, it may be for only Force/Tech Critical Chance, or it boost all Critical Chance. This PriStat affects the character’s Bonus Damage as well as Critical Chance. In most, if not all, situations you want to maximize your PriStat within your gear. The only notable exception is the unlettered Mods. Many of the endgame Mods available with commendations are the less favorable A variety. These have an overall lower stat budget than the unlettered equivalent. For example, a Deft Mod 34 is always superior to a Deft Mod 34A even though the A variety has higher PriStat. There is a bit more to PriStat and Critical Chance, but first let me outline the final element of Critical Chance. Critical Rating has been much maligned since 2.0 was released. People often cite the changes to its diminishing returns or DR as to why it is undesirable. This perspective is both right and wrong at the same time. First off, there was a change to the Critical rating formula when 2.0 was released. Each point of critical rating became roughly half as effective as pre-2.0. Thus, the right perspective on Critical Rating has to due with the comparative value of available alternatives. Ignoring augments, the substitute for Critical Rating in gear is Power. Power was unaffected in 2.0 and continues to increase Bonus Damage by 0.23 per point for DPS and 0.17 for Heals. Thus, compared to its alternative, Critical Rating became less desirable since 2.0. Next, the DR on Critical Rating is probably not at all what you think. Let’s first make sure we understand DR. Diminishing returns was a concept first analyzed by economists. The concept specifically dealt with the increased utility/benefit one derives from additional units. For example, if I were extremely thirsty I might really benefit from a bottle of water, perhaps I would benefit from a second bottle as well – although I wouldn’t benefit quite as much as from the first. Continuing on, I might benefit very little or not at all from a sixth bottle of water – I might instead benefit from a bathroom. The point being the first unit resulted in the greatest benefit while each successive unit resulted in less benefit. Let me present this visually. 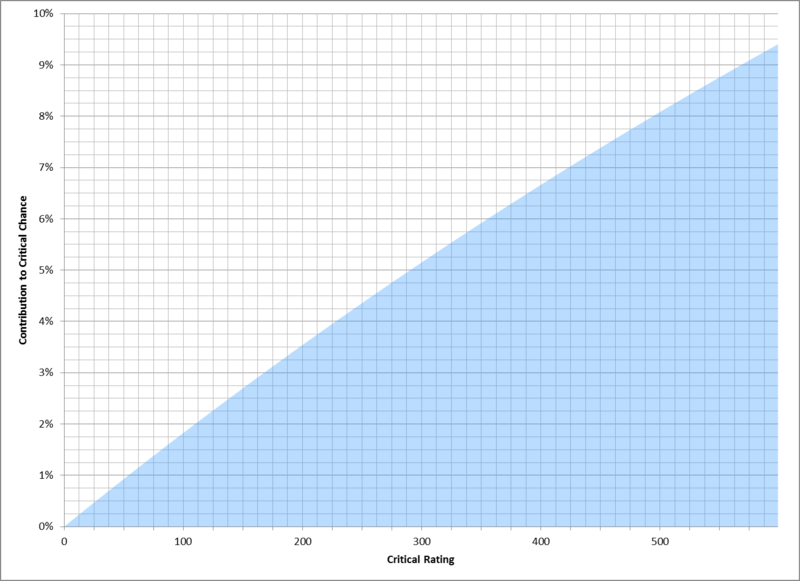 The graph below shows the contribution each point Critical Rating makes to Critical Chance. As you can see, it appears relatively linear. Thus, the DR of Critical Rating is not so punishing given low amounts of Critical Rating. So Why is X% Wrong? Is the target for Melee/Ranged or Force/Tech? Does the class have a boost to PriStat? At which gear level is the target? What is the split between PriStat and Critical Rating? So How Should I Think About Critical Chance? You shouldn’t! You should think about Critical Rating. The other elements of Critical Chance should not be a factor when determining the ideal amount of Critical Rating. Our baseline Critical Chance should be 11% inclusive of companion and class buffs. Next, you should be maximizing your PriStat. You are primarily doing this as it increases your Bonus Damage; the impact to Critical Chance is rarely a consideration. For example, you would always prefer a Reflex 34 armoring over a Reflex 31 armoring because it is more Aim. This increase in Aim also contributes slightly more to Critical Chance as well. Said another way, you would never not make this trade off because your Critical Chance was too high! Thus, we only have to consider our Critical Rating. You may want 100 Critical Rating for ~2% more Critical Chance or 325 Critical Rating for ~6% more Critical Chance. The important thing is that you are now focused on the right way to think about Critical Chance and Critical Rating. Oofalong is a well known theorycrafter from <The Chandrian> guild on the of The Shadowlands server and has contributed immensely to both the theorycrafting community on the SWTOR official forums and previously on mmo-mechanics.com. He aspires to help others understand the game’s mechanics and bring civility to SWTOR forums everywhere. This is great but it still doesn’t tell me what a decent crit rating should be. My Sorc ha 24%, should I sacrifice more power to take that higher? The recommend crit rating differs per class/spec and also on personal perference/play style. What spec is your sorc? The class guides I posted have specific recommendations if you look over the sorc dps or sorc healing guide. Yes, I agree, please don’t underestimate playing style, and or situation necessity. An Op healer IMHO benefits a bit more with a closer to but perhaps not over 400 crit rating, at least for my style. The additional idea is that when an op has to blow 2 GCD on an actual cast that you do so when crit is maximum either from a focused retribution proc or when you get the chance to wander over to a Sin circle of love, and again here the higher crit rating helps. Pare this style of Op healing with a good Sorc and even recently I am also liking the mitigation increase that a Merc healer brings to the table, that allows even more overall EFFECTIVE healing and this can be much greater than you would think where some think the crits are wasted with extensive over heals. What I do not understand is that at end game our gear choices are rather limited, thus making much of decisions about crit moot. I go with that the gear gives me. Awhile ago I was healing a FP and one of the other characters told me I had to too much crit and needed to balance power. I explained I was just wearing Blackmarket/Verpine gear with no crit added. I guess my real question is, is this guide more for the argument that we should trust the gear and not add crit? Or is it more to dispel the myths of crit system? I truly enjoyed the article, and appreciate Oof’s taking the time to explain it to us. Now if I could only find an article that explains Crew Skills and crits, because I believe most of the time I wasting my money sending companions out on missions to gain purple crafting mats. If you honestly think that the gear sets provided for your class are optimal, then maybe you should just stick to Crew Skills and crafting. What Dulfy said in the comment here; spec plays a huge role in this. Typically, a healer (regardless of which MMO) wants to minimize crit. Healers prefer consistent throughput rather than spiky RNG healing. This is also in part due to the fact that heals are in the unique position that they have a maximum effective amount. Lets say the tank is 5k hp from full health. If you crit for a 10k heal, you are still only healing for 5k, meaning that for that heal, any stat budget put into crit/surge would have been better spent on just about any other stat. Crit is far from useless for healers, it just typically is not as beneficial as alacrity or power. Is this too simple an analysis for Sorc Healers, given the importance of Force Surge? Getting Innervation to crit so that it generate stacks of Force Surge seems pretty important to maintaining enough Force in a long HM fight, as well as for the other benefits Force Surge provides. A little less average HPS in exchange for more Force Surge stacks might be a good choice at times. Other classes also get non-DPS/HPS benefits from crits, like the energy regeneration Operative DPS get from poison crits. So only considering the HPS/DPS impact of critical chance might be misleading. Overhealing is less an issue than old WoW players make it to be, at least when associated with crits. You’re not wasting resources, really, when your overhealing is because a few crits popped off when you didn’t need them. When overhealing does matter is when you’re wasting your energy to overheal those who don’t need it. Healers, at least sages, -do- need crit. We rely on Healing Trance crits for energy management. Having pretty, non-spikey heals that heal for 25 more per cast will be completely useless if you’re constantly running out of force. Likewise, having constant crits and lower baseline casts will end up making you just as useless. We have to painstakingly balance out our specific gearing needs. Up to a point, crit rating is infinitely more valuable than alacrity can ever be for us. But once you reach that point you’re again being very wasteful being over that point. Also, any endgame healer knows the value of those crits coming at the right moment and saving the raid a wipe! The number of perfect little raids where no one is never almost dying is pretty close to zero. So many raids have been saved by dual-hitting the alacrity and crit buffs and popping another 25k HP onto the tank in 2.5 seconds. For the sake of comparison let’s assume you are a healer like Dulfy. OK so, Dulfy is in full 78s right now, which means her Willpower is around 3,770 and contributes ~9.5% to Critical Chance. Let’s assume that you are in mostly 69s, which means your Willpower is around 3,300 and contributes ~8.5%. Thus, if the target Critical Chance was 20% for Sorc healers, you would need to invest more in Critical Rating than she would. This would make you a less effective healer as it would mean sacrificed some Power in order to get Critical Rating. You should target a specific Critical Rating. If you look at Dulfy’s class guide for Sorc healers it says the target Critical Rating is 100-300. I was trying to be a bit funny, I’ll admit but I was hoping tat the end of the article you would have given a nice average chance percentage. I know that you don’t want people to just aim for something like 35% but make what they think is best for their class and setup based on specs and abilities. I specifically did not create class/spec-specific recommendations as I would not be able to directly prove them all. I hope to only present provable ideas. Perhaps later I will try to aggregate something. Also, I want to make sure people understand the basics. I feel a lot of recommendations are made without understanding the basics. This leads to a lot of unnecessary squabbling. In other words, we can’t discuss calculus without first agreeing that 2 + 2 = 4. True Story: I inspected a Sorc, who is a generally competent player, and discovered they used exclusively used Power/Overkill augments. When I asked why, they said it was because their Crit was high enough – the guide said 25% and that is what they had so they switched to Power for increased Bonus Damage. I died a little inside then. This article – like the future ones – is not meant to tell you how to gear your toon. They are meant to get you to think critically about your gear. I am trying to make the concepts easy to understand so player can make more informed and better decisions about their gear. And how are the recommended Crit Ratings for the different class/specs arrived at? You need to look at the abilities used in order to estimate this. Since this is spec by spec, you will need to refer to a spec specific guide. So basically it is less important to get that “25%” Critical Chance and more the suggested 100-400 Critical Rating (varying with spec), as diminishing returns is not calculated on the Chance, rather the amount of points you have invested? That would make more sense, giving room for higher critical chance gained through my build that relies more on RNG anyways. Correct, there is no DR for Critical Chance. Two of the components have independent DRs. And, you should consider them as such. Wait…now I’m confused. According to your graph, Crit Chance doesn’t seem to have a steep DR, but according to all the guides Crit Chance should be between X and X due to High DR. SO, is it a high DR as per the guides or not a high DR per your graph? The class guides are written by someone else and they are not exactly correct about not stacking crit due to high DR. It is more of a case of not getting more benefit by getting more crit compared to other stats. So it should be treated as more of a stat window than anything else then with the low end of the window being just as effective as the high end regardless of whether or not I have 3K or 3.5K+ main stat? Again, just wondering due to a lack of percentage based sweet spot given. The graph is of Critical Rating not Critical Chance, there is a difference. I don’t know which guides you are referring to, but good guides should give you a target Critical Rating. Bad guides will give you a target Critical % or Chance. They either don’t understand how crit works or just copied from someone. I am not sure I can say it any clearer than my last post: There is no DR for critical chance, but two of its components have independent DRs. A very lucid article, Thank you very much and we want MOAR! I notice that your graph is indeed a fairly flat increasing line up to 500. I’m wondering about higher than that. does is noticeably flatten out at some point? I knew a few DPS’rs pre-2.0 who had stacked crit rating to get their crit chance over 50% (back then I was able to do the same with shield on my jug also, but that’s another article I hope) I’m wondering if 50% crit chance is even possible now. if so, is it even worth it given that you would have to sacrifice so much to stack that much crit and pristat? I will post link to another graph showing the full range of critical rating once I am in front of my computer. Nicely written. One thing: You imply that the *less important* primary stat boosts bonus damage and force/tech crit rating for all classes. But according to my Sage’s character sheet, strength boosts only melee crit rating and bonus damage, not force. Similar deal with Scoundrels, for whom aim improves ranged crit and bonus damage, but not tech. I think maybe what you said is true for Troopers and Jedi Knights, but it’s the opposite for the other two classes? You had me thinking for a moment that I needed to go back and get a couple Strength datacrons I skipped because they were too annoying. But unless I plan to whack things with my lightsaber on my Sage, I’m probably fine without. Hmm, I will need to look into this more. I am reasonably confident that what I presented is true, but I will go back and double check. It is possible BioWare made a change or the character sheets are bugged. Good Read. The DR was explained good. Need to increase my bathroom rating – the water critted me again. Minor hint: The first 100 points of Critical Rating increase Critical Chance by 1.99% and the next 100 points increase Critical Chance by 1.85% – only 0.14% less. Isn’t it either “0.14” or “14%”? I don’t think so. I could see a case for 0.0014 less, or technically I have could have quantified the delta as a percent change. Still, I don’t think the way it is presented is confusing. 1.99 – 1.85 = 0.14 whether it is a % or not. Thx to Dulfy and team for all the guides! Perhaps this will be touched on when Surge is discussed, but Surge is a factor in the value of Crit. The two stats are paired (i like to say they are “braided”) together, and raising one makes the other more valuable. To use the authors analogy, if you are hungry, you may want to eat some bread (Surge). But the bread is kind of dry, increasing how much you may value water (Crit). Surge bonuses from your skill tree to abilities that are integral to your rotation will make Crit more useful to you. Yeah, there will be some higher level/transcending topics later. For now, I want to establish the base knowledge. Yes, the Surge bonus from skill trees is incredibly significant when it comes to evaluating your ideal Critical Chance. For PvP its a little weird I’ve found. Hits seem to be capped at exactly 12,500. I’ve hit this high dozens of times on an Arsenal Merc and a Smash Jugg, but never more than that – I check the highest hit done on the score sheet at the end of the match. So critical chance, critical rating, surge and power need not be maximized. I’ve found the primary stat can even be ignored as much as possible since the boost to damage from Power is always higher with 0.23 per point versus 0.218 per point from the Primary Stat (for mercs anyway with the 9% primary stat boost). This way at least, your damage will be consistent whether or not you crit – crits I’ve found are random walks with drift more than they are regular random numbers generated by C.
Re: PriStat vs. Power for Bonus Damage you did not factor in the 5% Sith Inquisitor class buff to PriStat. Assuming a 9% buff to PriStat from a skill tree and the 5% class buff, you will have 0.228 Bonus Damage from PriStat vs. 0.23 Bonus Damage from Power. Once you factor in the increase to Critical Chance, PriStat will be a superior choice until PriStat is ~18,000. There may be some bolster oddities happening, but you can not ignore PriStat in favor of Power. How would crit rating benefit with a Marauder Carnage spec? I think this specific spec benefits more from power, same with Rage spec. Not sure about Annihilation spec tho. I have done a lot of modeling for Anni, and I feel very confident in saying Critical Chance is very relevant for this spec due to the free Surge that boosts your bleeds. Re: Carnage & Rage – there are other attacks other than autocrits that can benefit from Critical Chance for each spec. People who I know and trust have model it both ways and arrived at different conclusions. Thus, I believe it is very close. The bigger problem here is how much dps per point you get from crit rating vs power, because crit as in crit chance is always nice, problem is, what you have to sacrifice in order to get it. And while I’m not expecting you to write an in-depth analysis for each spec to account for auto-crits and surge increases, something like “A 5 min parse using only auto-attack with 0 crit is 800 on average, while with 100 crit and 72% surge it is an average of 820” would be more convincing than “100 crit rating gives 1.99% crit chance”. Don’t get me wrong though, what you explained you explained well, it just lacks some kind of a real scenario to demonstrate it. Thanks for the input. This is one of several topics that should create foundational knowledge of how the game works. Through this the goal is for people to better understand how their characters work as well as how to think about their gear. I doubt I will ever author something like you suggested. In fact, I would contend such a generic perspective would make things more confusing. Generic perspective obviously wouldn’t explain everything, but would give us something to think about. Without it, I still don’t really know how much DRs lower the value of crit rating vs power. “But I told you! 1.99% for first 100, another 1,85% for getting to 200 from 100, and there’s even an awesome graph!”. And that would be correct, but how beneficial is that 1,99%? how much less beneficial is that 1,85%? How does it compare to getting power instead? Because if for example, the first 100 crit rating gives 300 dps, while 100 power would give 150 dps, I’m all in for the first 100 crit and beyond. Meanwhile, if the first 100 crit rating gives 110 dps and 100 power gives 100 dps, I might go for the first 100 crit rating and then just keep stacking power. Good follow up, I think in a later article I will provide general estimates about how to think about any single stats effect on DPS. I do agree ballpark estimates might be nice. For instance, I believe for Anni Marauders 1% crit chance equals 17 DPS and 1 Power equals 0.37 DPS. Thus, if someone were to say 5% extra crit chance will yield 500 DPS I would be very suspect. I could believe variances of up to 2x from spec to spec, but any more than that and something doesn’t sound right. I think this is the type of general knowledge you mean, right? So what are the cap? Without getting diminishing returns? 1.) Critical Rating’s contribution to Critical Chance is capped at 30% assuming infinite points. 2.) Diminishing returns start at the second point invested in the stat. What you should be asking is, “What are the optimal stat levels considering the total stat budget I have available to me?” The answer to this question is dependent on the spec you play. Check the class guides here for some info on this. I do not believe your issues are related to Understanding Critical Chance. So I just looked on my BH who is only wearing 156’s right now. I haven’t played him in a while but his crit chance is at just over 30% which includes a crit rating of approx 540. I read dulfy’s guide about my BH (arsenal merc) and what it appears to me is that the recommendation is between 0-240. Why does this seem completely off to me? Maybe something changed a lot between when I first left and now or was I stacking way too much crit rating for a long, long time? Think my 162/168 gear will hopefully change this over the next couple months. I wanna say I was under the impression to take CC to 30% and Crit Multiplier to 67%. What level is your BH? the formulas vary as you level from 50 to 55. Also 30% Critical Chance includes PriStats contribution to Critical Chance. He’s 55. But did I read the info right with dulfy’s class guide saying you need at max 240 and I have over 500? Just making sure I’m interpreting it correctly. As it stands now, I’m looking to drop a bunch of crit rating with my next set. A crit rating of 500 is too high, would would be better served by moving some of that crit into power. i have a sith sorcerer and a sin. on my sorcerer i went through all companion stories and unlocked all that presence bonus. well now i pretty much play my assassin as a main but have not bothered to redo all those companions. do I still get the bonus for the 1%? or do i have to raise this toons faction as well? thanks for all the great reads. You should get them as well on your sin. Once you have already unlocked your companions on one toon it will provide the same bonus on all of your toons. Playing a dot spec full balance sage would you say it would be better to stack crit to get 30%. My theory being with up to 3 dots ticking every second you want each tick to have a better chance of a crit. If I played middle tree then I would stack power as u can guarantee a crit hit but I believe dot spec players should go for more crit. Do you agree with this theory? Is there any difference with companions? I am currently building up Jorgan. He has a 180 barrel, and mostly 162 gear. I am building him up with comms now. I generally leave him in a sniper stance, and turn off his AoE abilities (unless I click on them manually). His crit/surge percentages are currently at about 25/75. I don’t remember the ratings off hand. He has blue reflex augs in every slot, and I’m just trying to plan out the next upgrades as I get more ultimate comms. I hope, you don’t forget to use some Accuracy in hes gear? About a comps, there are the same math we have on ourselfs. I dunno about base stats for crit/surge, but all another math is all the same. Great article Oofalong! Thank you for posting it! Sorry, this is pointless. You say not to focus on chance, but to focus only on rating… and then you go on to how rating affects chance. You HAVE to focus on chance(just like you did in the article, despite saying not to…), because that is the factor which determines if it is worthwhile to keep stacking Critical. Another issue is that of Diminishing Returns… You only kind of touch on this issue, using the bottle of water analogy as your strongest point(even if that was unintentional). You don’t go into detail about how DR should be viewed, but rather focus on the direct diminishing effect of adding more Critical. The idea behind considering DR is to maximize your output by adjusting your stats and you cannot discuss the DR of Critical without at least mentioning Surge. These are two stats that go hand in hand and the DR of Critical is LARGELY dependent upon Surge. The focus on only direct percentage for DR is short-sighted. The point of looking at Diminishing Returns is to maximize the overall output of a given toon and it requires looking at all stats. Your post is pointless. You clearly don’t understand that critical rating is only a *part* of critical chance. Never look at the % because there are other factors involved. The only thing you can control is the amount of points you put into critical *rating* from gear. And you clearly have no clue what DR is. As it relates to what I’ve stated above, the concept is simply that the more critical *rating* you add, the less of a critical *chance* you will receive in return. It can be analyzed on a point-by-point basis. For every point of critical rating you add, you will get less and less contribution to the % from that point. That’s what it boils down to. And adjusting your stats is called “optimization” or “min-maxing”, not “DR”. Next time, don’t come on here challenging Dulfy and calling this a postless article unless you have a full understanding of what you’re talking about. You say my post is pointless and then go on to repeat what *I* and the guide has already stated. At this point, it’s clear you’re trolling. You didn’t actually take the time to understand what was being written. Looking at the article again only proves my point. There is very little merit to the article as a whole. Sorry if you feel otherwise. It LITERALLY mentions possibility of someone taking a lesser armoring due to crit % being too high… really?! If this is a basic guide, it probably shouldn’t even go into detail about DR. DR is only a minor aspect of the complex topic of Negative Returns. Negative Returns is the more pertinent aspect, incredibly more important than DR will ever be. It needs to be rewritten to be clear and concise. As it stands, the article is full of contradictions and information that a beginner has no use for. There is some good information to be had here, but there’s a lot of nonsense, too. The goal of the article was to explain Critical Chance, its components including Critical Rating, and what opportunities the player has to affect Critical Chance. Could you expand on precisely what contradictions there are? Also, I do not understand how the concept of Negative Returns applies to this – or any single stat – in SWTOR. Hi , i have question , or DR are only on CR ? What about primary stats and other secondary stats ? I would love to see how Surge plays into this, I mean I know based on how much surge you have is how much more damage/heal affect you will have, but is there a DR for that as well and if so what affects it? and I’m not exactly sure about DR like lets say hypothetically I added 500+ critical rating, that will be a 8% increase to overall Critical chance. Comparing the water analogy after a certain while having 500% will overall have more DR. I understand the PriStat and all that and to focus more on how Critical Rating plays more of an effect. I’m just having a hard time of figuring when will there be a substantial DR, as well as how Surge plays into this. Why aren’t percentage increase/decrease considered when deciding on how much critical rating should be used? DR is important, but a poor DR can still increase your stat more than the increase from an alternate stat with better DR. Specifically, I’m talking about the crit vs power debate. I can post numbers later.